It’s funny how life sometimes throws up an experience that opens your eyes to new possibilities. 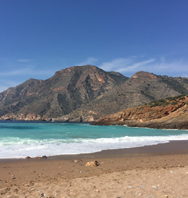 Several years of UK holidays, with unpredictable weather and a reliance on overpriced tourist attractions to entertain our daughters led us to a radical decision – a trip abroad! Some ‘restructuring’ at work meant that if we didn’t do it now, we might never do it and we determined to grasp the nettle and go for it. Our daughters had never been abroad, my wife and I hadn’t been for fourteen years and we had never been abroad for two weeks. Truly this was a radical departure on many levels for us! It had to be just right though – good value, plenty of sunshine and above all, as long time Naturists, it had to offer the option of clothes free recreation in a family friendly environment. 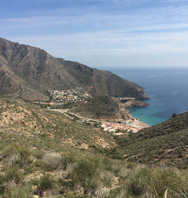 Our research soon narrowed the field and we decided on the well known resort of El Portús, set in the Costa Calida in southern Spain (we’d never been to Spain either – so that was another first!). 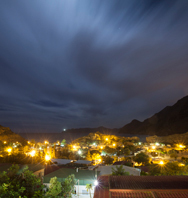 We booked through the resort’s UK representative, Andrew Welch (www.elportusuk.com) and booking could not have been simpler, with helpful advice offered from someone who clearly knows the resort and locale inside out. 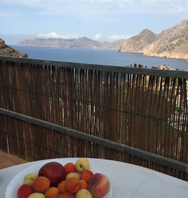 Rather bravely we settled on the first two weeks of the school summer holidays – a period when this part of Spain is hot or, more descriptively, HOT! 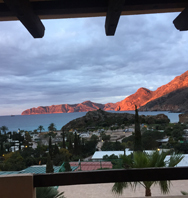 We flew out of Stansted with Ryanair into Murcia San Javier airport, which is an easy half hour or so drive from El Portús along well maintained and signposted roads. 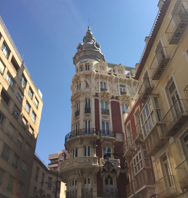 It is also possible to fly into Alicante, though the drive is of course longer. 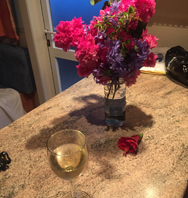 I shall skirt around the horror of dealing with the car hire company – this review need not be tainted by such matters – but all I’d say is, choose wisely and read reviews! Anyway, we collected our car and set off on our journey to the resort. The directions provided by Andrew were the most detailed I have ever seen and we were soon passing through the nearest main town, Cartagena, as our girls looked wide eyed at the landscape outside, the Spanish street scene and the very lovely Spanish buildings in their rich palette of colours. 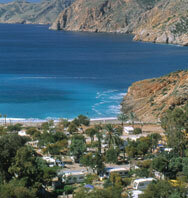 El Portús is nestled in a south facing bay in a rural location in an area of Spain designated as a national park. Mountains tower over the resort, giving it a wonderful sheltered feel. This becomes apparent as you get closer and the landscape becomes more rugged and rural – and indeed very beautiful. I frequently found myself in contemplative moments gazing up at the mountain tops and wondering what the view must be like from up there and which brave/foolhardy souls would venture to the summits. On arrival at the resort the check in was straightforward and the friendly English speaking reception staff soon had us on our way to our mobile home. 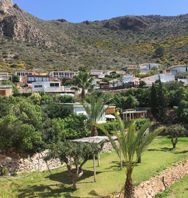 We chose a ‘B type’ and the one we were allocated was set at the bottom of the hillside, offering beautiful views across the resort and out to the sea. The cabin itself was compact, with a dining area/kitchen area, three bedrooms and a toilet and shower room. There was ample space to stash out suitcases and clothes (yes, we brought far too many clothes as it happened – we won’t do that again!). 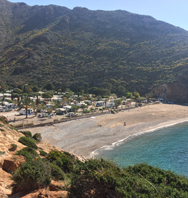 The compact nature of the mobile home is not a problem – after all you don’t travel to Spain to spend your days indoors when there is a glorious beach nearby and guaranteed sunshine! The kitchen had a hob and sufficient crockery, cutlery and utensils to prepare basic meals. Given the weather (did I mention, it was HOT!?) we mainly lived on delicious cooked meats, cheeses and salads, and we supplemented this by buying a cheap barbecue from the nearby hypermarket which, stereotypically landed me doing much of the cooking (that good old man, meat, fire process!). Anyone with children will know the daily rigmarole of getting them showered and out in the mornings. We soon found it easier to send half the family to one of the nearby sanitarios (shower blocks) to speed up our morning and evening routines. These are well cleaned, and are bright and modern and one has laundry facilities (while you may not have many clothes to wash, your beach towels will certainly need a freshen up during your stay!) . One unusual and amusing feature of the sanitarios is that the loo roll dispensers are located outside the cubicles. 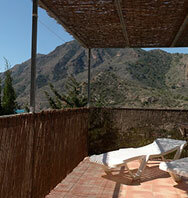 We never established if this is a Spanish thing or an El Portús thing, but it certainly hones one’s estimation skills! There is an onsite supermarket, more like a corner shop size in reality, which is a veritable Aladdin’s cave of groceries and useful goods. Part of our daily routine was for someone to head there each morning for delicious, still warm, artisan bread for that day’s lunch. The supermarket also offers you the chance to try shopping naked – okay that may sound an odd thing to mention, but if you’ve never tried it, it’s one of those slightly humorous experiences that being a naturist throws up from time to time – just don’t try it at Tesco when you get home though! For a greater selection and cheaper prices, it’s worth doing a ‘big shop’ at the Eroski hypermarket, which is about 15 minutes way in Cartagena. 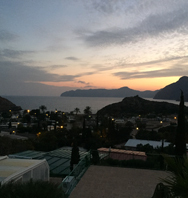 Frankly though, this involves dragging yourself away from the resort and you may find the extra few Euros it costs at the on-site shop is worth it to avoid the inconvenience. So, to the resort itself. 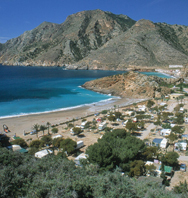 It is a fascinating location with a combination of mobile homes, apartments, camping pitches and permanent residents. Some of the permanent residents’ pitches are quite beautiful and the whole diverse mix makes for a unique ambience. Our mobile home was about two minutes from the beach so we were able to be laid out soaking up the sun very quickly every day, returning ‘home’ for lunch, then heading back down until early evening. The beach is mainly of shingle and pebble, though one end is sandier. The sea was mainly very gentle during our stay, though a few days were characterised by some fairly hefty waves, which were great for the girls to enjoy being washed onto the shore in a flurry of arms and legs! Daytime temperatures were averaging about 32°, though a couple of days hit a truly melting 38°! To help cope with the heat, there is a refreshment kiosk right on the beach and we were able to keep ourselves well stocked with cold drinks, ice creams and a very delicious lemon ice slush. 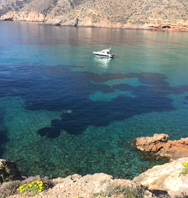 We bought the girls some snorkels from the Eroski hypermarket and this led to hours (days!) of fun as they watched the very pretty fish that swim close to the shore. The beach is very safe and very family friendly and in fact this was the first holiday we have been on where the girls were happy to stay on the beach all day. In fact those dread words “Muuuum, we’re bored” were not uttered for the full two weeks. 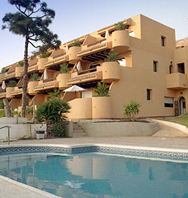 Near to the beach is the outdoor swimming pool. Spotlessly clean, with grass surrounding it and some trees for shade this makes a respite from the beach if you need it and offers the chance to cool down (it’s HOT here, remember!). it is also the focal point for the organised children’s activities, which cover a variety or arts, crafts and games, led by the ever cheerful Raqel. Ours took part in a treasure hunt, and the youngest took part in an art session and it was great to see them mixing with other kids from across Europe, learning a few words of each other’s language. The main restaurant is next to the pool and while we didn’t try it ourselves, there were certainly some enticing smells from the kitchen! This is also the venue for the evening entertainment and hosts a variety of discos and live music, along with themed evenings , such as a ‘hippy night’. There is a second swimming pool higher up on the site and this is used more during the ‘low season’ periods, having a retractable enclosure. We didn’t use this pool, but it was equally as spotless as the main pool from what we saw. Given that our main objective was a sunshine and beach holiday to chill out and get some colour, we didn’t venture off site too frequently. We paid a few visits to Cartagena, which I had naively imagined would be a dusty container port. How wrong I was! It is a beautiful, modern town with main streets full of pleasant shops and restaurants and a very lovely sea front and marina. We dined out a couple of times and found some good restaurants, in one of which we experienced a fine seafood paella, brimming with squid, octopus, prawns and langoustines at a price per head that would just about buy you a pallid microwavable imitation in a UK supermarket! 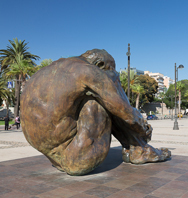 Cartagena also as a rich history, being key in both Roman times and during the Spanish civil war. 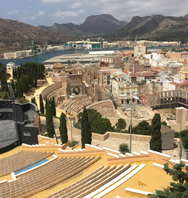 There are many attractions in this fine town, but we chose to visit the Roman Theatre (awesome!) and the (very sobering) Civil War Bunker Museum via the panoramic lift. 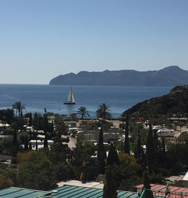 There was much, much more we could have seen and done in this lovely town, but the lure of El Portus is indeed strong and we soon wanted to get back on site, get our clothes off and hit the beach! So what was the final verdict? 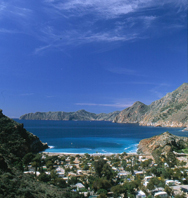 El Portús is quite simply wonderful. 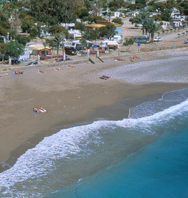 The accommodation is comfortable and is perfect for a beach holiday. 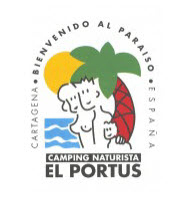 It is a perfect resort for both seasoned naturists and also for those who want to experience a naturist holiday for the first time and ease themselves gently into this amazing lifestyle. We loved it and we’re already saving our pennies for the next visit!